Muted inflation and the sudden drop in oil prices will help shape the Federal Open Market Committee’s decision on when to boost interest rates. The dangers of falling commodities prices. As constant readers might recognize, that suggestion comes from my illustrious predecessor in this space, the late and much-missed Alan Abelson. Yet, some 9½ years since it was proffered here, it remains largely unheeded, especially in the environs of Sony’s Hollywood offices, from which all sorts of embarrassing e-mails were recently hacked, notably between the studio’s head, Amy Pascal, and a high-powered producer, Scott Rudin. We were further stunned that in their exchanges, Pascal and Rudin made racially insensitive comments about President Obama’s preferences in films. Shocking, in the epicenter of extreme political correctness. Not for nothing do hypocrisy and Hollywood make for a fine alliterative pair. Not since the 1970s and 1980s, when there were revolts against the Fed chief, has the central bank displayed any real fractiousness. Maybe that’s because the spotlight on the central bank is so much brighter these days. Moreover, the Fed is far more forthcoming today in communicating what it’s doing and thinking. There was a time when that had to be inferred from arcane signals sent through open-market operations, which had to be mastered by Fed watchers (and journalists covering the central bank). These days, such knowledge is as useful as knowing DOS commands would be for the average personal-computer user. A lot has happened since September, notably robust gains in employment and the collapse in oil prices. So what does the FOMC do? It’s hard to imagine somebody with more insight into that question than Don Kohn, the former Fed vice chair and a 40-year veteran of the central bank, who briefed clients of Potomac Research Group last week. Along with most other Fed watchers, Kohn says the FOMC remains on track for a mid-2015 liftoff for the fed-funds target. Moreover, he thinks the panel will scrap its avowed intention to keep the funds rate near zero for a “considerable time,” as do most observers. But there are wild cards in this data-dependent projection. “Despite dramatic improvement in the labor market and signs of solid [gross domestic product] growth, Don still believes the risks to the economy are slightly to the downside, and he thinks the FOMC agrees,” Greg Valliere wrote in his invaluable daily Morning Bullets missive to PRG clients. The major concerns are global economic weakness and an inflation rate well below the Fed’s target, he added. Kohn thinks that Yellen & Co. will look past the recent plunge in energy prices, but concedes that some of the decline could creep into core inflation. The key is inflation expectations; if they fall further, that would be quite troubling for the central bank and could forestall a midyear liftoff, even if the jobless rate continues to drop, he adds. The bottom line for the markets is that, in place of the “considerable time” pledge, the Fed will promise to be “flexible and data-dependent—and the trajectory of rate hikes, once they begin, will be tentative and gradual,” Kohn concludes. And, one presumes, there will be no trash talk about other policy makers. ODDS OF A MIDYEAR FED RATE HIKE got a good bit longer after the steep selloff last week in crude oil and stocks, culminating in Friday’s 300-plus-point drop in the Dow industrials, with the S&P 500 barely clinging to 2000. For the week, investors in U.S. stocks wound up $875 billion poorer, their worst showing in more than three years, significantly cutting their 2014 gain to $1.5 trillion. The benefits from the crash in crude and lower gasoline prices should make up for this pummeling of the plutocrats. And the Commerce Department’s report on November retail sales, released Thursday, seemed to confirm that. The larger-than-expected 0.7% gain suggested consumers were taking their energy windfalls to the malls. But the numbers trumpeted on the tube are seasonally adjusted. And when Stephanie Pomboy, the maven of MacroMavens, dug into the data, she found that the seasonal adjustment (fudge factor, to normal folks) artificially enhanced the results to a surprising extent. Specifically, she relates, the adjustment assumed a 0.3% decline in retail sales—even with all the frenetic promotions to lure shoppers into stores or online. When the statisticians assume a drop, they add back the fudge factor to offset the presumed seasonal influences. In contrast, the Commerce Department had assumed robust retail-sales gains in previous Novembers—1.8% in 2013, 2.5% in 2012, 2.8% in 2011, Steph finds. Not since the recession times of 2008 and 2009 did Commerce assume a negative November for retail sales. These fudge factors make it easier for reported numbers to top expectations. With the recovery purportedly getting stronger, “that doesn’t seem to make a whole lotta sense now, does it?” she writes in an e-mail. Meanwhile, inflation—the equal part of the Fed’s dual mandate along with employment—seems likely to fall further below the central bank’s target. That’s evident from market-based indicators, notably the relative yields on nominal Treasury securities and Treasury Inflation Protected Securities, or TIPS. Based on those indicators, expected inflation five years hence—the Fed’s favored measure—has collapsed to the lowest level since 2009, according to David P. Goldman, head of Americas for Reorient Capital in Hong Kong. Based on that indicator alone, the Fed would be expected to be easing (not likely) instead of tightening, he writes. Given this, the futures markets’ forecast of a 1.5 percentage-point rise in the fed-funds target in two years represents “cognitive dissonance at 200 decibels.” According to the CME, fed-funds futures are pricing in a 0.75%-1% rate by the end of 2015, significantly below the 1.375% predicted by the FOMC in its last forecasts, in September. Rarely do the market tell-tales all flutter in the same direction, but now that’s toward deflation. It isn’t just oil doing the signalling; it is other goods ranging from iron ore to milk. Meanwhile, junk bonds issued by leveraged energy companies, which helped finance the oil boom, are under siege, while yields on longer-dated Treasuries continue to grind lower, with the 30-year bond smashing through the 3% barrier and getting gangbuster demand at near-record lows. All of which suggests something is afoot other than the purported tax cut that is supposed to accrue from the energy-price slide. In inflationary times, a drop in prices at the pump is a windfall. But when high energy prices and cheap money create a boom in shale—producing the most vibrant sector of the U.S. economy, in earnings, capital expenditures, and employment—an oil-price plunge can be a dangerous problem. Thinking that the economic effects of lower gas prices are the same as they would have been in the 1970s is as outdated now as my yellow-orange Opel Manta, in which I listened for updates on Patty Hearst’s abduction while I waited patiently in a gas line during the first oil embargo. There is a big disconnect between the US Federal Reserve and the international bond markets. It is a disconnect that could lead to one of the biggest sell-offs in bonds for a long time. Some fund managers even say 2015 might be like 1994 all over again, when the government bond markets crashed as the Fed aggressively raised interest rates. Wesley Sparks, the head of US fixed income at Schroders, the UK fund house, says he has never seen such a big divergence between US central bank projections for interest rate rises, as laid out in the so-called dot plot chart that shows where voting members of the Fed think benchmark rates will be at the end of upcoming years, and the forecast of the market, expressed in Fed fund futures. US central bank policy makers expect the main Fed funds rate to rise from near zero today to 1.25 per cent by the end of next year, with the first rate rise pencilled in for next June. The market projects rates to end 2015 at 0.50 per cent, with the first rate rise in October. By the end of 2016, the Fed’s policy makers forecast rates at 2.75 per cent, while the market has them at 1.50 per cent. By the end of 2017, Fed policy makers expect rates to be 3.75 per cent compared with market forecasts of 2.0 per cent. Bill Eigen, head of absolute return fixed income at JPMorgan Asset Management, warns of a potential bloodbath in bonds next year should the market continue ignoring the warnings of aggressive rate rises that the Fed has clearly signalled in its dot plot charts. Of course, his worries might prove unfounded. The 32-year bull run in bonds may keep powering on as it has this year, despite dire warnings of a big correction in the market at the start of 2014 from almost every large fund manager and analyst on Wall Street and in the City of London. It has to be pointed out that the likelihood of full-blown quantitative easing in Europe (which is expected early next year), the benign global inflation outlook and continuing sluggish growth in many industrialised economies suggest that bond yields, which have an inverse relationship with prices, might remain low in 2015. But in the US, there has to be risks that yields will rise sharply, should the Fed stick to its forecasts and start tightening policy aggressively in the middle of next year. With yields on 10-year US Treasuries close to all-time lows and nearly a percentage point lower than they were when the year began, yields surely have only one direction to go — and that is up. If US yields do head north, then yields in other government bonds are likely to follow, despite benign inflationary pressures and the launch of QE by the European Central Bank. It means 2015 could be a tricky year for fixed income fund managers, particularly those running long-only portfolios. This might explain why absolute return funds have become more popular, as these funds can short the market and use derivatives to protect capital in the event of a blow-up in bonds. For example, some absolute return funds have bought emerging market credit default swaps to protect portfolios against a sharp jump in yields. Mr Eigen has as much as 60 per cent of cash in his flagship fund, which he will only put to work once the bond market corrects. It is a mug’s game trying to predict markets, as the spectacular failure of most bond forecasts this year proved. But with Fed policy makers and the markets so badly out of sync over the path of rates, there has to be a possibility that the bond markets in 2015 will experience a similar collapse to 1994, when yields nearly doubled in value. What Does This Week's Big Twist In The U.S. Treasury Market Mean For The Next 10 Years? Current Treasury yields rose 0.07% to 0.08% at 1 to 3 years and fell 0.12% and 0.10% at 20 and 30 years. 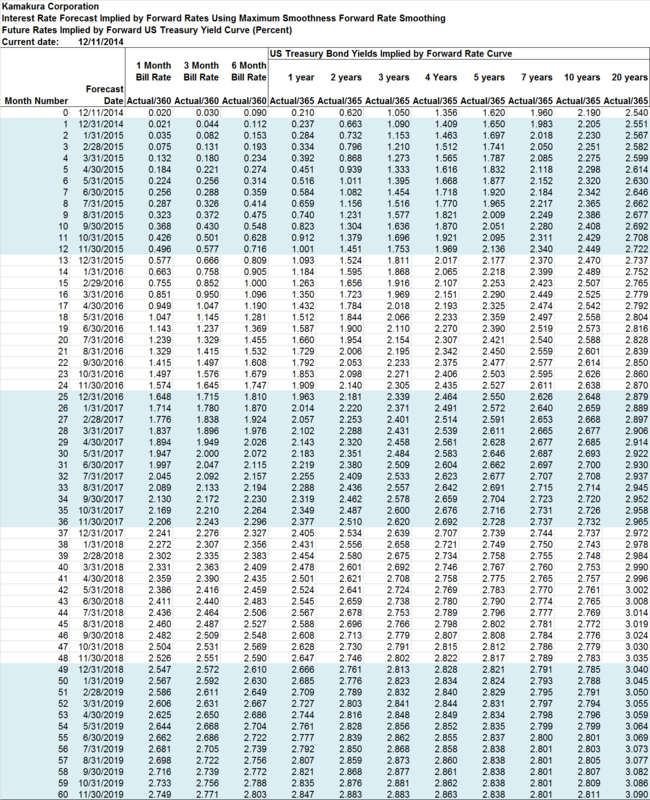 The implied path for 1 month forward Treasury bill rates shows a peak at 2.91% in June 2021, 0.14% lower and 4 months later than implied last week. Forward 10-year Treasury yields in 2024 were implied at 3.00%, a major drop of 0.21% from last week. Implied forward Treasury bill rates showed a major twist in shape as current Treasury yields rose 0.07% to 0.08% in the one to three-year maturity range and fell 0.12% and 0.10% at 20 and 30 years. Forward 1-month T-bill rates now rise steadily until June 2021, with the peak hitting 2.91%, 0.14% lower and 4 months later than last week. The largest increase in implied forward 1-month T-bill rates was 0.18% in October 2015. 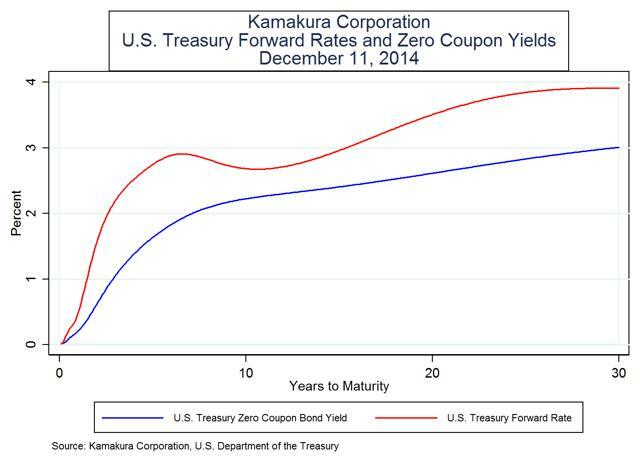 The largest drop in implied forward 1-month T-bill rates was 0.21% in November 2024. The implied forecast also shows forward 10-year U.S. Treasury yields rising to 3.00% in 2024, down 0.21% from last week. We also present three potential scenarios consistent with the implied forecast that represent alternative paths for interest rates. This kind of multi-factor scenario generation is essential for comprehensive asset and liability management at banks, insurance firms, pension funds, and endowments. These scenarios are consistent with a multi-factor rate model benchmarked in 52 years of U.S. history, discussed below. For an update of the outlook for mortgages and the valuation of mortgage servicing rights, please see Kamakura Corporation's weekly mortgage forecast. 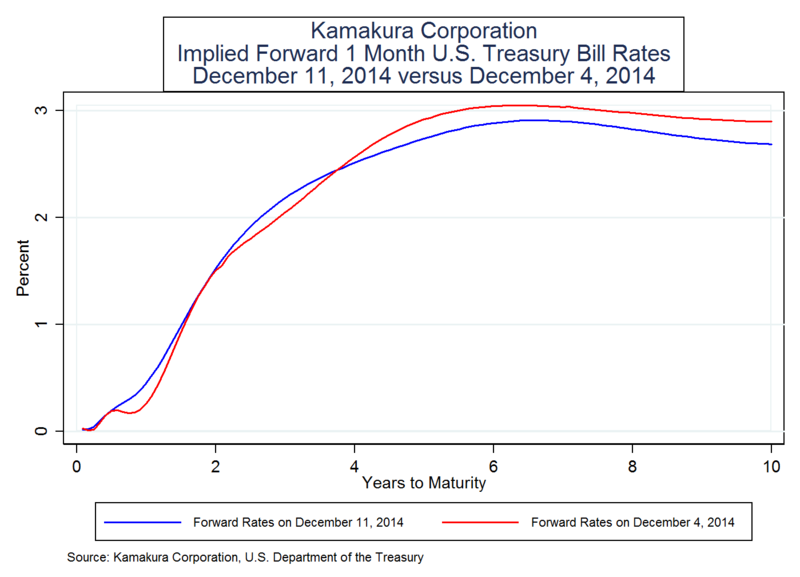 Over the next 120 months, the maximum implied forward 1-month T-bill rate is 2.91%. The implied forward 1-month T-bill rate increases until reaching a peak at June 30, 2021. The largest increase in implied forward 1-month T-bills versus last week's forecast is 0.18% on October 31, 2015. The largest decrease in implied forward 1-month T-bills versus last week's forecast is -0.21% on November 30, 2024. The U.S. Treasury 10-year yield decreased this week by -0.06%. The 10-year U.S. Treasury yield is projected to reach 2.45% in 1 year, a change of 0.26% from current levels. Looking ahead 10 years, the 10-year U.S. Treasury yield implied by current bond prices is 3.00%, a change of 0.81% from current levels. The details behind these highlights are explained below. Many readers who are not familiar with forward rate calculations assume they are a forecast of interest rates with no more credibility than any other forecast. This is an error of understanding that we seek to clarify here. A forecast is a product of judgment, sometimes combined with analytics. Forward rates, which we often label as "implied forecast," involve no judgment. Forward rates are the mechanical calculation of break-even yields such that investing in any maturity U.S. Treasury and rolling it over for 30 years will yield the same amount of cash in 30 years as investing in any other maturity. For example, if one is given the 4-week U.S. Treasury bill yield and the 13-week Treasury bill yield today, one can calculate how much the 9-week Treasury bill must yield in 4 weeks for a strategy of buying the 3-month Treasury bill or the one-month Treasury bill, followed by reinvestment in a 9-week bill, to yield the same amount of cash in 13 weeks. This calculation involves no more judgment than the calculation of the yield to maturity on a bond. 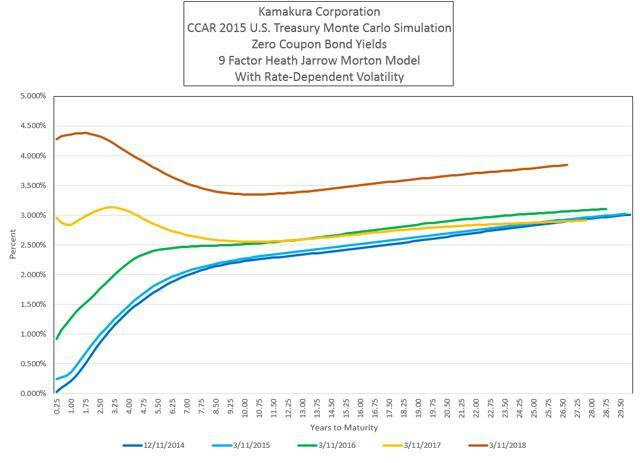 How does one use forward rates to forecast interest rates or to simulate them forward for asset and liability management or other risk management purposes? A series of authors beginning with Ho and Lee in 1985 and then followed by Heath, Jarrow, and Morton in a number of papers beginning in the late 1980s answered this question. The future path of interest rates must bear a specific link to forward rates that depends on the number of random factors driving interest rate movements and the nature of the volatility of those factors. In general, researchers agree that forward rates are biased higher than the average actual rates that will come about because long-term investors earn a risk premium for their long-term commitment of funds. The "expectations hypothesis" taught in economics for at least the last five decades postulated that, contrary to recent findings, forward rates were on average an unbiased forecast of interest rates. This is now understood to be incorrect. Forward rates play an important role, however, in understanding where actual rates will end up. 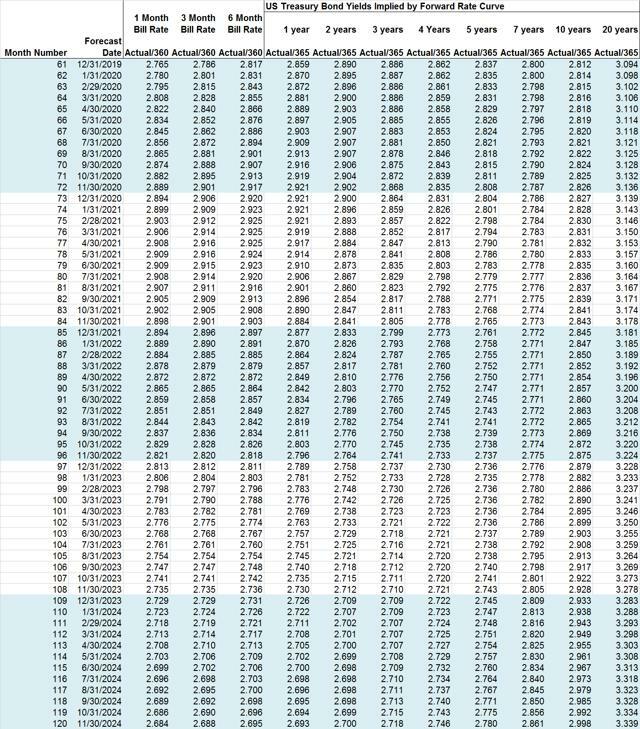 The empirical relationship between forward rates and actual rates, using actual historical data from multiple countries, is a subject we will return to in the near future. For an introduction to the topic, we encourage readers to review recent Federal Reserve research by Swanson (2007), Rosenberg and Maurer (2008), Kim and Orphanides (2007), and Adrian, Crump, Mills and Moensch (2014). We refer readers with a technical background to the 2005 and 2008 papers by John Cochrane and Monika Piazzesi on this topic. Other excellent papers include Durham (2014), Rudebusch, Sack and Swanson (2007), and Cochrane (2007). The implied forecast takes the Treasury yield curve as a given and does not attempt to reverse the impact on the curve of quantitative easing by the Federal Reserve. See Jarrow and Li (2012) and Chadha, Turner and Zampolli (2013) for estimates of the impact of quantitative easing on Treasury yield levels. We explain the background for these calculations in the rest of this note. The implied forecast allows investors in exchange traded U.S. Treasury funds: iShares 20+ Year Treasury Bond ETF (NYSEARCA:TLT), ProShares UltraShort 20+ Year Treasury ETF (NYSEARCA:TBT), Direxion Daily 30-Year Treasury Bull 3x Shares ETF (NYSEARCA:TMF), Direxion Daily 30-Year Treasury Bear 3x Shares ETF (NYSEARCA:TMV), iShares 7-10 Year Treasury Bond ETF (NYSEARCA:IEF), iShares 1-3 Year Treasury Bond ETF (NYSEARCA:SHY); bond funds: PIMCO Total Return ETF (NYSEARCA:BOND), Vanguard Total Bond Market ETF (NYSEARCA:BND); municipal bonds: Nuveen Municipal Value Fund (NYSE:NUV) and exchange traded mortgage funds: iShares Mortgage Real Estate Capped ETF (NYSEARCA:REM) to assess likely total returns over the next 120 months. Today's implied forecast for U.S. Treasury yields is based on the December 11, 2014 constant maturity Treasury yields that were reported by the Department of the Treasury at 4 p.m. Eastern Daylight Time December 11, 2014. 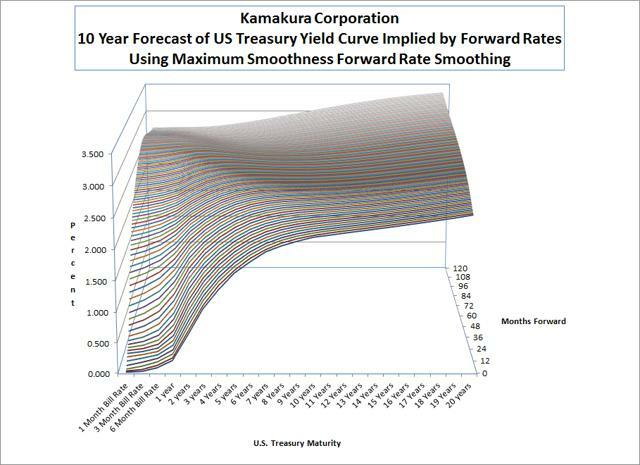 The U.S. Treasury "forecast" is the implied forward coupon bearing U.S. Treasury yields derived using the maximum smoothness forward rate smoothing approach developed by Adams and van Deventer (Journal of Fixed Income, 1994) and corrected in van Deventer and Imai, Financial Risk Analytics (1996). 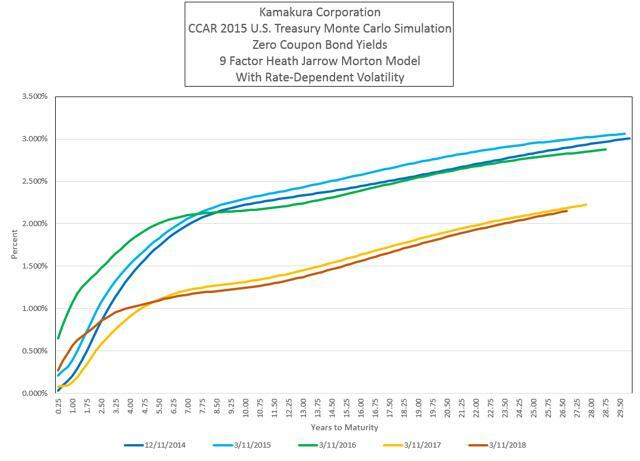 Kamakura Corporation recently announced new research by Managing Director Robert Jarrow, which confirms that the maximum smoothness forward rate approach is consistent with the no arbitrage conditions on interest rate movements derived by Heath, Jarrow and Morton . There are other yield curve smoothing methods in common use, which violate the no arbitrage restrictions. Among the methods, which cannot meet the "no arbitrage" standard are the Svensson, Nelson-Siegel, and Merrill Lynch exponential smoothing approaches. This graph shows the projected current path for 1-month implied forward Treasury bill rates in blue. Last week's implied forward path is shown in red. In the rest of this section, we highlight three of the infinite number of scenarios that could come about. We ensure that these scenarios are consistent with an efficient, "no arbitrage" market for U.S. Treasury as described by Heath, Jarrow and Morton (1992). We start with the current U.S. Treasury curve. We assume that a 9 factor model drives U.S. Treasury rates at maturities ranging from 3 months to 30 years. 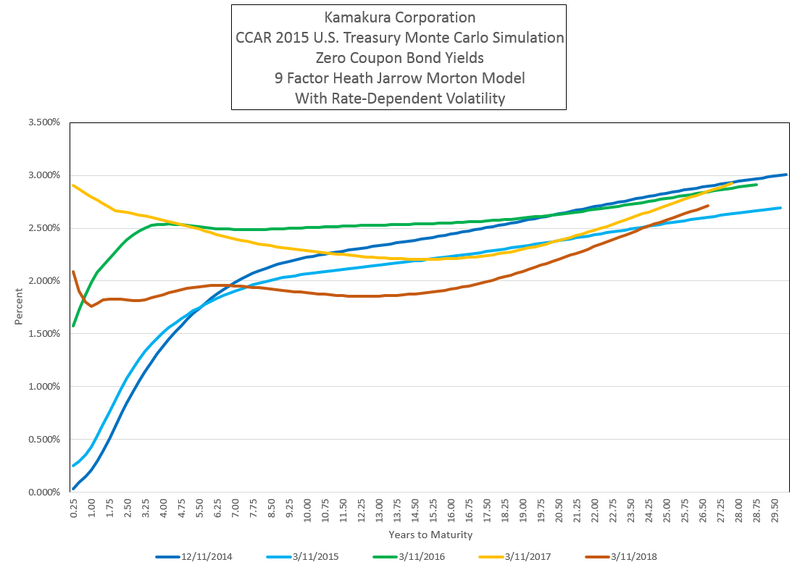 The basis for this model is the study released by Kamakura Corporation on March 5, 2014, that proves at least 9 factors are needed to accurately model quarterly rate changes. The study makes use of more than 52 years of daily data from the U.S. Department of the Treasury and the Board of Governors of the Federal Reserve. The 9 factors used are 6 more factors than the Federal Reserve used in its 2014 Comprehensive Capital Analysis and Review stress tests and 3 more factors than required by the March 2010 version of the Basel II market risk framework (see page 12, paragraph b) of the Bank for International Settlements. We use more factors for maximum consistency with U.S. yield curve history. The parameters of the model are estimated by Kamakura Corporation using quarterly data from 1962 through September 30, 2014. 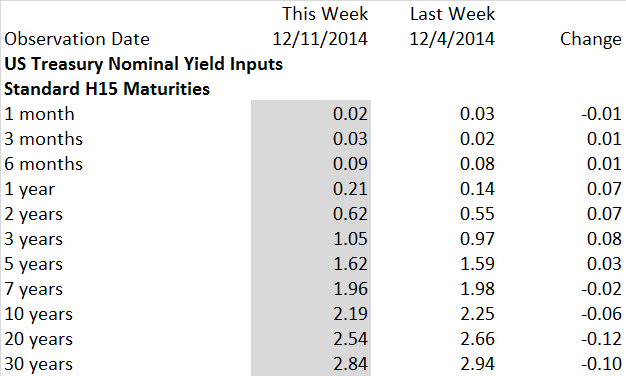 Interest rate volatilities used rise as interest rates rise for 5 of the 9 factors. The model parameters are available by subscription from Kamakura Risk Information Services. The market consensus "implied forecast" (forward rates) is shown later in this report. We now turn to three specific scenarios selected by Kamakura's analytics team for their special features. The Federal Reserve's Comprehensive Capital Analysis and Review ("CCAR") process focuses on three specific scenarios provided by the Federal Reserve. In this section of our weekly commentary, we start with the forward curve for the current date, which we explain below in our implied forecast. 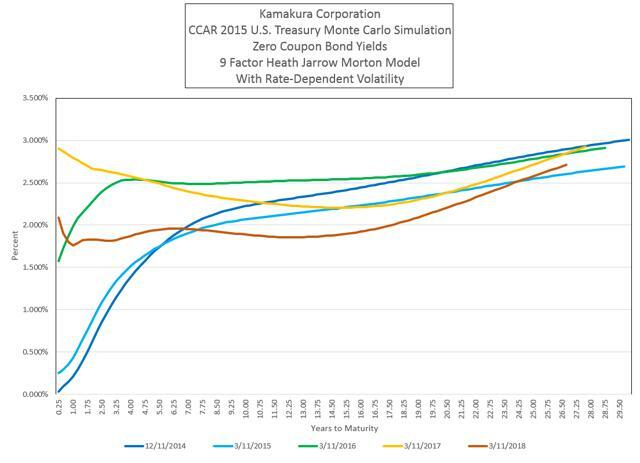 In this section of the report, we use Monte Carlo simulation in the Heath Jarrow and Morton framework using Kamakura Risk Manager. We project 13 quarters, consistent with the CCAR program, but we generate a large number of scenarios randomly. We select 3 that we hope will be of interest to readers. In the first scenario, the initial U.S. Treasury yield curve is shown in dark blue. In the first scenario, after a small rise in March 2015 (in light blue), the curve shifts up modestly on the short end of the curve in March 2016 (in green) and then shifts down in March 2017 (in yellow). In March 2018 (in red), the U.S. Treasury curve twists up slightly on the short end with long rates finishing near 2.00%. In the second scenario, the U.S. Treasury curve powers up consistently after a near zero change in yields in March 2015 (light blue). Rates then move up in March 2016 (in green), March 2017 (in yellow) and March 2018 (in red). In the Monte Carlo simulation of potential rate paths done for this note, most of the scenarios were similar to this one. There is no respite for long-term bond holders in this scenario, with the long end of the U.S. Treasury yield curve settling near 4.50%. In scenario 3, the U.S. Treasury curve twists down slightly on the long end of the curve during 2015 (in light blue). In 2016, shown in green, the curve shifts up moderately with the largest increases on the short end of the curve. The curve in 2017 (in yellow) twists up on the short end of the curve and down at longer maturities. Rates shift downward in 2018 (in red), with long-term rates finishing at about 2.60%. This scenario was fairly rare in this week's Monte Carlo simulations. 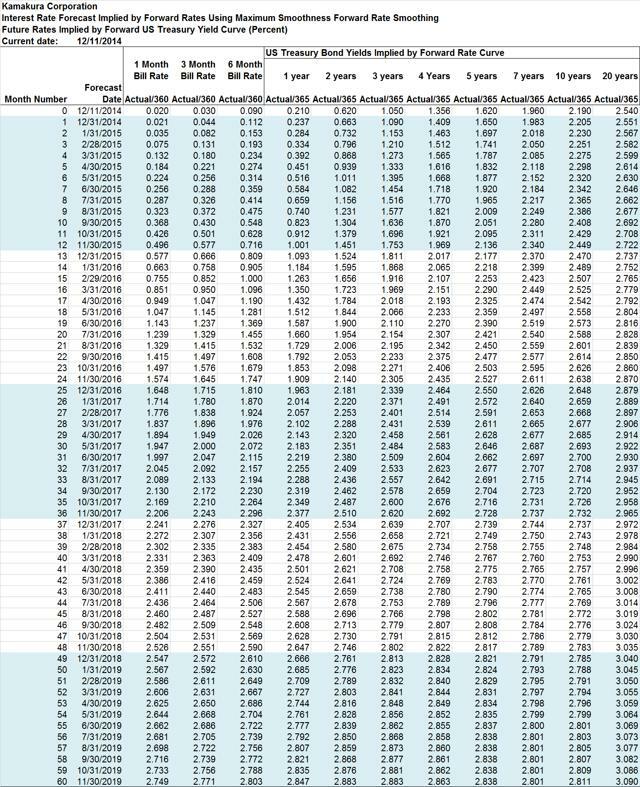 All of these scenarios are plausible in that ((A)) they begin with the current U.S. Treasury curve and they are (B) simulated forward in a no arbitrage fashion ((C)) using historical U.S. Treasury volatilities. That being said, there are an infinite number of possible forward curve shapes and paths, and these three have been selected more for their drama than anything else. If one were to select only one scenario to focus on, it would be the forward rate "implied forecast" explained in more detail below. 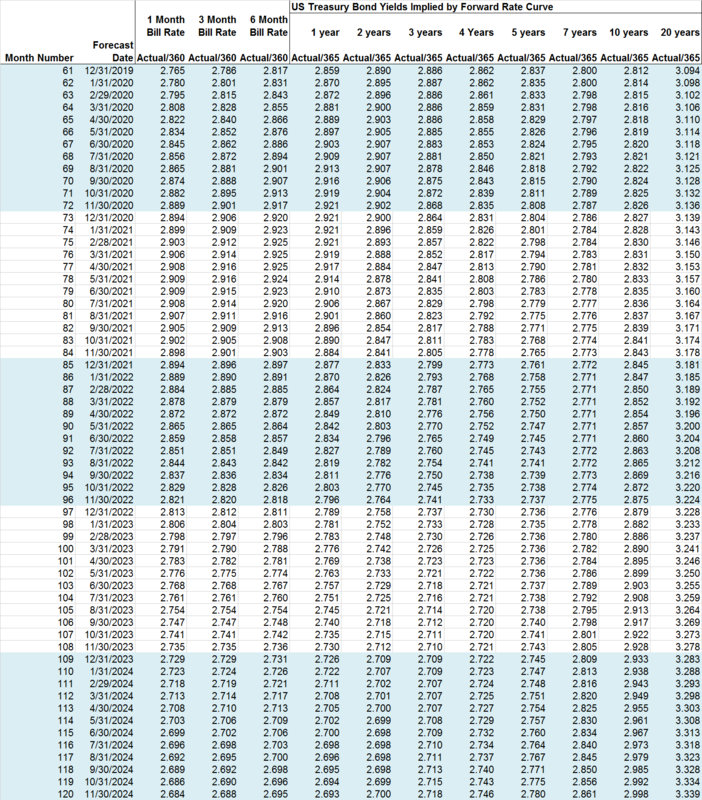 The Federal Reserve H15 statistical release is the source of most of the data used in this analysis. The Kamakura approach to forward rate derivation and the maximum smoothness forward rate approach to yield curve smoothing is detailed in Chapter 5 of van Deventer, Imai and Mesler (2013). Younger readers may not be familiar with the dramatic movements in interest rates that have occurred in modern U.S. economic history. Older readers were once familiar with these rate movements, but they may have forgotten them. Kamakura Corporation has provided a video that shows the daily movements in forward rates from 1962 through August 2011. To view the video, follow this link. IF INVESTORS thought they could take things easy in the run-up to Christmas, enjoying the traditional “Santa rally”, they are instead facing the Grinch. Old fears have returned to remind them of the many risks 2015 may bring. The first risk, ironically, is the consequence of good news. America added 321,000 jobs in November, suggesting that its economy is growing strongly. That, along with a monthly rise in average hourly earnings of 0.4%, raised expectations that the Federal Reserve might start to push up short-term interest rates in 2015. Central banks have been helping to propel stockmarkets for so long that it is not clear whether prices are justified by fundamentals or are simply the consequence of easy monetary policy. The fall in the oil price is also good news. By transferring spending power from producers to consumers, it may boost global GDP growth in 2015. But while consumers may gain, the effect on some oil-producing countries such as Nigeria, Russia and Venezuela will be extremely adverse. Such a sharp fall in the oil price puts huge pressure on government revenues and raises the prospect of financial turmoil next year. There has also been a sell-off in the currencies of many developing countries, with JPMorgan’s Emerging Market Currencies Index hitting a 14-year low. Another long-standing worry that has returned to the fore is the stability of the Chinese financial system in the face of weakening growth. After the People’s Bank of China cut interest rates last month, the Shanghai stockmarket went on a tear, rising by nearly a quarter in two weeks. But on December 9th the market fell by 5.4%, the biggest single-day loss in five years. Though it has since rebounded a little, trading has become very choppy. Regulators are reported to be checking that brokers are sticking to the rules limiting margin financing, suggesting that the rally stemmed at least in part from the illegal use of leverage. But the most scary of the ghosts of Christmases past is the seldom-distant spectre of a renewed euro-zone crisis. Greece’s coalition government has called for a decision on a new president by December 29th; if 60% of its parliament cannot agree on a candidate, a new election will be called. The leading party in the polls is Syriza, a left-wing grouping which opposes the bail-out programme, rejects austerity and wants a renegotiation of (ie, reduction in) the country’s debt. The prospect caused the Greek stockmarket to fall by almost 13% on December 9th, its worst one-day decline since 1987. If Syriza does take power and demands a renegotiation, or cancellation, of Greece’s debt, Europe’s leaders will face a tricky choice between what might be called the “Frozen” and “Buzz Lightyear” options. If Greece’s demands seem too unreasonable, the temptation will be to follow the advice of the hit song from “Frozen” and “let it go”—cut the Greeks off from financing by the European Central Bank (ECB) and see if a chastened Syriza party comes back to the table. The risk of such an approach is of contagion, with investors fearing that a Greek exit from the euro could set a precedent for other countries to leave, causing a sell-off in the bonds of Portugal or Italy. The alternative would be to do some deal that extends the Greek debt even further, “to infinity and beyond” in the catchphrase from the “Toy Story” films. In that case, the danger would be that other countries would feel Greece had been treated favourably and demand similar deals. The credibility of the reform process would come into question. Which option will be chosen? 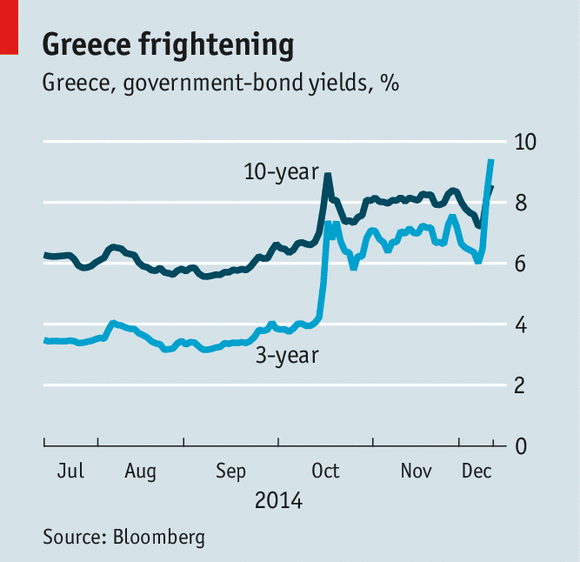 The yield on the three-year Greek government bond has risen above that on the ten-year bond (see chart). A sharp rise in short-term bond yields can mean that investors think the central bank will push up rates, but that is highly unlikely in this case. Instead, investors are clearly worried about taking a write-down on their bonds. This risk has been building for some time. Mario Draghi, head of the ECB, stopped the rot in 2012 with his “whatever it takes” promise to save the euro. But European voters have since been treated to an endless diet of austerity and lower living standards; they are fed up. They see little difference between the mainstream parties of the centre-left and centre-right and are turning towards the extremes. It may start with Greece but it won’t stop there: look at the poll ratings of Marine Le Pen in France, for example. In Britain, the rise of UKIP may mean another hung Parliament in 2015 and an exit from the EU in 2017. Political risk is on the march. PRINCETON – In the pantheon of economic theories, the tradeoff between equality and efficiency used to occupy an exalted position. The American economist Arthur Okun, whose classic work on the topic is called Equality and Efficiency: The Big Tradeoff, believed that public policies revolved around managing the tension between those two values. As recently as 2007, when New York University economist Thomas Sargent, addressing the graduating class at the University of California, Berkeley, summarized the wisdom of economics in 12 short principles, the tradeoff was among them. The belief that boosting equality requires sacrificing economic efficiency is grounded in one of the most cherished ideas in economics: incentives. Firms and individuals need the prospect of higher incomes to save, invest, work hard, and innovate. If taxation of profitable firms and rich households blunts those prospects, the result is reduced effort and lower economic growth. Communist countries, where egalitarian experiments led to economic disaster, long served as “Exhibit A” in the case against redistributive policies. In recent years, however, neither economic theory nor empirical evidence has been kind to the presumed tradeoff. Economists have produced new arguments showing why good economic performance is not only compatible with distributive fairness, but may even demand it. For example, in high-inequality societies, where poor households are deprived of economic and educational opportunities, economic growth is depressed. Then there are the Scandinavian countries, where egalitarian policies evidently have not stood in the way of economic prosperity. Early this year, economists at the International Monetary Fund produced empirical results that seemed to upend the old consensus. They found that greater equality is associated with faster subsequent medium-term growth, both across and within countries. Moreover, redistributive policies did not appear to have any detrimental effects on economic performance. We can have our cake, it seems, and eat it, too. That is a striking result – all the more so because it comes from the IMF, an institution hardly known for heterodox or radical ideas. Economics is a science that can claim to have uncovered few, if any, universal truths. Like almost everything else in social life, the relationship between equality and economic performance is likely to be contingent rather than fixed, depending on the deeper causes of inequality and many mediating factors. So the emerging new consensus on the harmful effects of inequality is as likely to mislead as the old one was. Consider, for example, the relationship between industrialization and inequality. In a poor country where the bulk of the workforce is employed in traditional agriculture, the rise of urban industrial opportunities is likely to produce inequality, at least during the early stages of industrialization. As farmers move to cities and earn higher pay, income gaps open up. And yet this is the same process that produces economic growth; all successful developing countries have gone through it. In China, for example, rapid economic growth after the late 1970s was associated with a significant rise in inequality. Roughly half of the increase was the result of urban-rural earnings gaps, which also acted as the engine of growth. Or consider transfer policies that tax the rich and the middle classes in order to increase the income of poor households. Many countries in Latin America, such as Mexico and Bolivia, undertook such policies in a fiscally prudent manner, ensuring that government deficits would not lead to high debt and macroeconomic instability. On the other hand, Venezuela’s aggressive redistributive transfers under Hugo Chávez and his successor, Nicolás Maduro, were financed by temporary oil revenues, placing both the transfers and macroeconomic stability at risk. Even though inequality has been reduced in Venezuela (for the time being), the economy’s growth prospects have been severely weakened. Latin America is the only world region where inequality has declined since the early 1990s. Improved social policies and increased investment in education have been substantial factors. But the decline in the pay differential between skilled and unskilled workers – what economists call the “skill premium” – has also played an important role. Whether this is good news or bad for economic growth depends on why the skill premium has fallen. If pay differentials have narrowed because of an increase in the relative supply of skilled workers, we can be hopeful that declining inequality in Latin America will not stand in the way of faster growth (and may even be an early indicator of it). But if the underlying cause is the decline in demand for skilled workers, smaller differentials would suggest that the modern, skill-intensive industries on which future growth depends are not expanding sufficiently. In the advanced countries, the causes of rising inequality are still being debated. Automation and other technological changes, globalization, weaker trade unions, erosion of minimum wages, financialization, and changing norms about acceptable pay gaps within enterprises have all played a role, with different weights in the United States relative to Europe. Each one of these drivers has a different effect on growth. While technological progress clearly fosters growth, the rise of finance since the 1990s has probably had an adverse effect, via financial crises and the accumulation of debt. It is good that economists no longer regard the equality-efficiency tradeoff as an iron law. We should not invert the error and conclude that greater equality and better economic performance always go together. After all, there really is only one universal truth in economics: It depends. Please allow me to revert back again a little to what I wrote earlier today in Will Oil Kill The Zombies? I think we need to be clear on what’s going on here. The oil market actually works. And that’s a rarity in today’s world of manipulated everything, of no mark to market, of huge stock buybacks financed by zero interest rates, you know the story. It’s not about where WTI and Brent are at any given moment. Even if WTI is down another 3.60% today so far at $57.79. Whatever WTI tells us, the real world out there trumps it by a mile and a half. The prices at which oil actually sells in the real world are way below WTO and Brent standards, a very big and scary development. There are tons of parties that will sell at any price they can get. There is no better way to drive prices down further, it’s a vicious circle down a drain. The market is setting future prices as we go along, that’s the – inevitable – mechanism. It’s called price discovery. We knew ISIS was selling at $30 or so, but tar sands at $30 and both Canada and Venezuela heavy crude at $40, that’s way more than an outlier. At WTI standard prices, too many can’t move nearly enough product anymore, and with credit having been slashed, moving product is the sole way to survive. How much of this ongoing process would you think we have we seen to date? While the U.S. financial system – as well as many international banks – has gotten hopped up on a wide assortment of financial opiates and stumbled through more than a dozen bank-fueled crises through the decades, Canada boasts a stellar track record of banking sobriety. However, a spectacular death spiral in crude-oil futures – West Texas Intermediate settled Thursday at $59.95, a more than five-year low – threatens to deliver a serious shock to the banking system of the U.S.’s northern neighbor, according to a research note published Thursday by Pavilion Global Markets. Canada ranks as one the world’s five largest energy producers and a net exporter of oil, according to the U.S. Energy Information Administration. So, a big drop in oil would pose several risks to Canada’s oil-dependent economy. “The drop in oil prices, as mentioned above, will have wide-ranging implications on the Canadian economy,” Pavilion strategists Pierre Lapointe and Alex Bellefleur said in the note. It’s not just that Canada’s banks will find themselves saddled with souring loans from underwater energy producers. The problem, Pavilion argues, is that Canada’s employment rate could suffer as oil-related businesses are forced to close. This is what I’ve been hammering on for weeks: the benefits of cheap oil are no match for the destruction that touches on a thousand different parts of our economies. It doesn’t help that much of both Canadian and American oil, especially the unconventional kinds, were drowning in debt even before oil turned south with a vengeance. But that’s not even the most crucial part. Our entire economies revolve around oil, it’s not just something that you put in your car, oil is everywhere, it’s built our world and it maintains it.. And therefore the effects of a sudden 40% price drop – and counting – will be felt everywhere. What we’ve seen so far can still be labeled ‘orderly’, but that’s not going to last. Still, look at the bright side: at least you can say that for once in your life you’ve witnessed a functioning market. NAGORO, Japan (AP) — This village deep in the rugged mountains of southern Japan once was home to hundreds of families. Now, only 35 people remain, outnumbered three-to-one by scarecrows that Tsukimi Ayano crafted to help fill the days and replace neighbors who died or moved away. At 65, Ayano is one of the younger residents of Nagoro. She moved back from Osaka to look after her 85-year-old father after decades away. "They bring back memories," Ayano said of the life-sized dolls crowded into corners of her farmhouse home, perched on fences and trees, huddled side-by-side at a produce stall, the bus stop, anywhere a living person might stop to take a rest. "That old lady used to come and chat and drink tea. That old man used to love to drink sake and tell stories. It reminds me of the old times, when they were still alive and well," she said. Even more than its fading status as an export superpower, Japan's dwindling population may be its biggest challenge. More than 10,000 towns and villages in Japan are depopulated, the homes and infrastructure crumbling as the countryside empties thanks to the falling birthrate and rapid aging. In Japan's northeast, the massive earthquake and tsunami that struck in March 2011, killing more than 18,000 people, merely hastened along the decline. First the jobs go. Then the schools. Eventually, the electricity meters stop. Neither Prime Minister Shinzo Abe's ruling Liberal Democratic Party nor any of its rivals have figured out how to "revive localities," an urgent issue that has perplexed Japanese leaders for decades. But some communities are trying various strategies for attracting younger residents, slowing if not reversing their decline. In Kamiyama, another farming community closer to the regional capital of Tokushima, community organizers have mapped out a strategy for attracting artists and high-tech companies. Nagoro is more typical of the thousands of communities that are turning into ghost towns or at best, open-air museums, frozen in time — a trend evident even in downtown Tokyo and in nearly or completely empty villages in the city's suburbs. The one-street town is mostly abandoned, its shops and homes permanently shuttered. The closure of the local elementary school two years ago was the last straw. Ayano unlocks the door and guides visitors through spotless classrooms populated with scarecrow students and teachers. When she returned to her hometown 13 years ago, Ayano tried farming. Thinking her radish seeds may have been eaten by crows, she decided to make some scarecrows. By now there are more 100 scattered around Nagoro and other towns in Shikoku. Like handcarved Buddhist sculptures, each has its own whimsical expression. Some sleep, their eyelids permanently shut. Others cuddle toddler scarecrows, or man plows and hoes. Ayano brings one along for company on her 90-minute drive to buy groceries in the nearest big town. But most remain behind, to be photographed and marveled at by tourists who detour through the winding mountain roads. 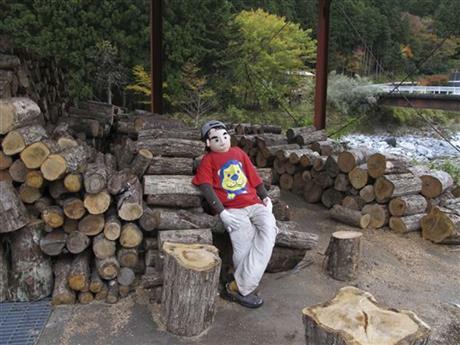 "If I hadn't made these scarecrows, people would just drive right by," said Ayano, who greets a steady stream of visitors who wander through the village. The plight of Japan's countryside partly a consequence of the country's economic success. As the nation grew increasingly affluent after World War II, younger Japanese flooded into the cities to fill jobs in factories and service industries, leaving their elders to tend small farms. Greater Tokyo, with more than 37 million people and Osaka-Kobe, with 11.5 million, account for nearly 40 percent of the country's 127 million people, with another 10 million scattered in a handful of provincial capitals. "There's been this huge sucking sound as the countryside is emptied," said Joel Cohen, a professor at Columbia University's Laboratory of Populations. Japan's population began to decline in 2010 from a peak of 128 million. Without a drastic increase in the birthrate or a loosening of the staunch Japanese resistance to immigration, it is forecast to fall to about 108 million by 2050 and to 87 million by 2060. By then, four in 10 Japanese will be over 65 years old. The government has a target of preventing the population from falling below 100 million, but efforts to convince Japanese women to have more babies have yielded meager results. Young Japanese continue to drift from the countryside into big cities such as Tokyo, where the birthrate is a mere 1.13 children, thanks to long working hours, high costs and killer commutes. The population of Miyoshi, which is the town closest to Nagoro, fell from 45,340 in 1985 to about 27,000 last year. A quarter of its population is over 75 years old. To entice residents to have more children, the town began offering free nursery care for third children, free diapers and formula to age 2 and free health care through junior high school. "The way to stop this is to get people to have more babies," said Kurokawa, whose own three children and seven grandchildren still live in the area. "Apart from that, we need for people to return here or move here. We need them all." But it's not an easy sell, despite the fresh air and abundant space. "You can't just grab people by the necks like kittens and drag them here," Kurokawa said. "They have to want to live here." To match potential occupants with empty homes, towns like Miyoshi are setting up "empty house banks." Across Japan there are 8.2 million such "akiya," or empty homes, more than a tenth of all residential buildings. But getting residents of half-empty towns to accept newcomers can also be a challenge. In Kamiyama, to the east, the town still struggles to convince owners who are often relatives living in distant cities to open up abandoned homes for rent or renovation, said Shinya Ominami, chairman of a civic group that has led efforts to revive the town. Kamiyama, a town of about 6,000, set up an "Artists in Residence" program in 1999. The installation of fiber optic cable enabled the town to begin marketing itself as a location for IT satellite offices with rents as low as 20,000 yen ($200) a month. Eleven companies have come so far. In a briefing for potential investors and visiting officials from other areas, Ominami shows a slide of the town's shopping street, dotted with houses that are empty, and then another with some of the buildings filled with new businesses — a bistro, a design studio, an IT incubation hub. "In Kamiyama, 50,000 yen rent gets you a really luxurious property," Ominami said. By drawing in younger new residents and encouraging businesses that cater to them, like an organic foods pizza parlor and a gelateria, the community can actually breathe new life into older, traditional industries like farming, he said. "People think of decline as something pathetic. That's too vague. We need to think more clearly about this," Ominami said. "Once we accept this is the reality, we can figure out how to cope with it."